Many of our readers know Abbé Ed Gardner. 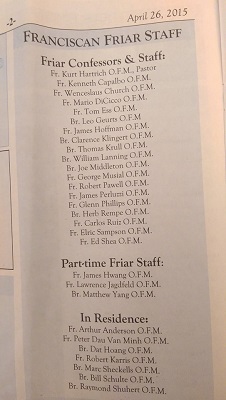 Originally a member of Ann Arbor’s Christ the King Parish – interestingly, a non-territorial Charismatic parish – Ed has been a seminarian at the Institute of Christ the King’s seminary in Gricigliano, Italy for the past eight years. During his trips home he has assisted at the altar at some of our local Tridentine Masses. On July 2, Deacon Gardner will be ordained a priest by Raymond Cardinal Burke at Church of Saints Michael and Cajetan in Florence, Italy. He requests your prayers as this important day approaches. 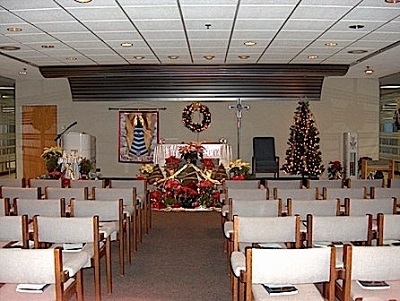 A reader came up with a follow-up suggestion for last week’s column on Office Building Chapels: Many airports have chapels where Catholic Masses are offered. 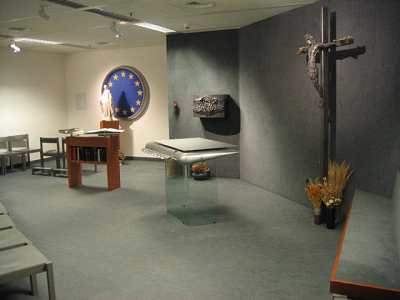 Some have artwork of questionable taste, as for example at the Brussels, Belgium airport, where the altar is made out of an airplane wing [photo above by Tim Bray]. Most airport chapels are multi-purpose, non-denominational, and bland; Atlanta’s is a perfect example. A few airport chapels are overachievers, however, most notably those at Chicago’s Midway and O’Hare Airports: [O’Hare Chapel pictured above]. Prior to the construction of the new terminal ten or so years ago, Midway was known for holding daily Mass in an unused gate area. Multiple announcements were made over the P.A. : “Catholic Mass to be held at Gate so-and-so in fifteen minutes”. Nowadays both Chicago airports have dedicated chapels with an assigned chaplain offering daily Mass, Confessions, and adoration before the reserved Blessed Sacrament. See the Chicago Airports Catholic Chaplaincy web site for more details: www.cacc.us. But wait...there’s more. There is a National Conference of Catholic Airport Chaplains, with a web site listing all of the airport chapels in the U.S. and in the world offering Catholic Masses. Most chapels on the list have no regularly scheduled services; others including Toronto and London Heathrow have a fairly busy schedule. Boston rivals Chicago with number of Masses. See www.ncacc.us for more details, and consider searching out a chapel the next time you have an hour or two before your flight. Priest Shortage? What Priest Shortage? Speaking of Chicago, downtown’s St. Peter in the Loop Church merits some mention. During a recent visit, this writer noticed the remarkable number of clergy assigned to the church, which is not a parish and primarily caters to local workers. With seven Masses each weekday and Confessions offered non-stop from 7:30 AM – 6:00 PM Monday-Friday, these men are kept quite busy. These days it’s common to hear about declining attendance at Catholic schools, along with closures of many parish schools. One standout exception to this trend is St. Agnes School, the K-12 institution associated with St. Paul, Minnesota’s St. Agnes Parish. Not long ago St. Agnes School’s future was in question, but a recent newsletter mentioned that with the school’s renewed emphasis on the Classics, Latin, traditional Catholic teachings and sacred music, enrollment has surged to record levels, there is a waiting list for students, and a 50,000 square foot addition is being built. Some students commute over 40 minutes each way. With the Extraordinary Form, the Ordinary Form in Latin, 30 orchestral Masses per year, multiple choirs, Sunday Vespers, and all Masses celebrated ad oríentem at the High Altar, St. Agnes Parish and School walk the talk, and the effort is bearing fruit.